The Facts About Luther. Written by Msgr. Patrick O’Hare in 1916 and republished by TAN Books (www.tanbooks.com) in 1987. Even though this book is a bit polemic, it is nevertheless, an important read, telling the whole story of Luther that Protestant authors and historians have failed to tell. This book is a sobering, eye-opening, record-straightening analysis of the life, thought, and work of Martin Luther. Steve Ray found this quote so interesting he went on to cite it in his books Crossing the Tiber and Upon This Rock. In both instances he cites The Facts About Luther as the source and also mentions the quote comes from Luther's letter to Pope Leo X, January 6, 1519. I debunked this reference back in 2008: Luther's Imaginary Letter to Pope Leo X, January 6, 1519. The quote is not at all from any such letter (even if it were from Luther's January 6, 1519 letter, that letter was never sent). Father O'Hare used two quotes from two different sources, neither of which were any sort of letter to Pope Leo X (the details are here). As bad as that is, Mr. Ray mis-cited O'Hare as well. O'Hare first quotes Luther saying "I never approved of a schism, nor will I approve of it for all eternity", and then mentions the alleged letter. To help all who are anxious to come to a knowledge of the truth as it is in Christ Jesus and His Church, it may be well to recall that Luther before he formally separated himself from obedience to Rome and when he seemed to abhor such a course, declared "I never approved of a schism, nor will I approve of it for all eternity." In a letter written by him in 1519 to the then reigning Pontiff Leo X. and quoted in the History of the Reformation by that partisan Merle D'Aubigne, he says, "That the Roman Church is more honored by God than all others is not to be doubted. St. Peter and St. Paul, forty-six popes, some hundreds of thousands of martyrs, have laid down their lives in its communion, having overcome hell and the world; so that the eyes of God rest on the Roman Church with special favor. Though nowadays everything is in a wretched state, it is no ground for separating from the Church. On the contrary, the worse things are going, the more should we hold close to her, for it is not by separating from the Church we can make her better. ,We must not separate from God on account of any work of the devil, nor cease to have fellowship with the children of God who are still abiding in the pale of Rome on account of the multitude of the ungodly. There is no sin, no amount of evil, which should be permitted to dissolve the bond of charity or break the bond of unity of the body. For love can do all things and nothing is difficult to those who are united." (See De Wette, I, 233 ff.) [source]. O'Hare was not one for primary sources. In this instance, he says the alleged letter to Pope Leo can be found "quoted in the History of the Reformation by that partisan Merle D'Aubigne." That can be found here (see page 241). D'Aubigne does not say the statement is from a letter to the Pope. O'Hare mis-cited D'Aubigne. Above in black bold face I highlighted one particular sentence from O'Hare's citation of Luther: "I never approved of a schism, nor will I approve of it for all eternity." O'Hare doesn't document this sentence, so if one isn't careful, one may simply assume it's from the same source O'Hare goes on to quote. It is not. It is probably from Luther's debate with John Eck. Elsewhere D'Aubigne cites Luther stating, “I do not like and I never shall like a schism. Since on their own authority the Bohemians have separated from our unity, they have done wrong, even if the Divine right had pronounced in favor of their doctrines; for the supreme Divine right is charity and oneness of mind” (p. 258). McGiffert translates the same phrase as "Never have I taken pleasure in any schism whatsoever, nor will I to the end of time." I find it highly improbable that Father O'Hare translated this statement from the Latin primary source. O'Hare relied heavily on secondary sources, so eventually the source he used will surface. As to the content of the quote itself, Steve Ray is ignoring what Boehmer calls "the conventional, curialistic style" and the accepted means of dialog with Rome, as well the politics of the Reformation. This isn't the first time I've covered Mr. Ray's references to Luther. Probably the oddest thing Ray was doing in regards to Luther was selling Luther's Works on his website, well, until I mentioned it. To be deep in history for some Roman Catholic apologists isn't really all that deep. I can almost understand somebody with a website posting unverified information, but shouldn't publishing information in a book be held to a higher standard? If Roman Catholic apologists recommend incompetent secondary sources, I'll have no shortage of blogging material. Here's a bit of tedium. The draft letter from Luther to Pope Leo X dates from either January 5 or 6, 1519 (see LW 48:100). There are some sources that date this letter March 3, 1519. For instance, Currie's The Letters of Martin Luther and Henry O'Connor's Luther's Own Statements. This appears to be a possible error these authors picked up from DeWette. Read some Steve Ray and some O'Connor. Truly pitiful stuff. 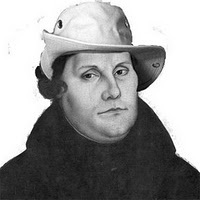 On the other hand, Luther was always most grateful that he never brought about any schism but that he was excluded by force and not his own chosing. The innovator and the schismatic was not he, but the pope. The same principle may apply to those who find themselves in liberal synods now. They should speak up until they are thrown out and not leave of their own choosing. This may apply mostly to those who are teachers. Where is the magesterium or Ray's local bishop slapping his wrist for this shoddy or worse propaganda. I guess, maybe, falsehood can be overlooked by some if it helps Romes cause. Is the phrase "by hook or crook" in the Apochrypha?